And here is another using all countries in the WorldBanks dataset with GDP per capita > 10K. Here I am displaying both the WorldBank’s NHE (GDP component) and the WHO’s NHE data (note: this data is not complete and the numbers are slightly different). Note: Regardless of the NHE figures used (i.e., World Bank vs WHO), neither is that well correlated with GDP per capita and these correlations are certainly not a simple linear relationship (as in the two charts at top). This situation is even worse if you look at this in NHE at the percentage of GDP terms. I excluded a lot of poor countries (<10K/yr GDP per capita) and I honestly did not make any attempt to manipulate this data. You might get a slightly different result with better matching of WHO figures (string matching/vlookup on different country naming conventions) but the essential conclusion is no different if you pick a reasonably broad array of countries and do not systematically exclude outliers. The point here should be very clear: this sort of analysis is highly sensitive to which countries are selected for comparison. A few petro states, financial centers, offshoring banking, tourism-driven economies, and other atypical countries will quickly blow this analysis up. Moreover, it already looks as if there is not a simple linear relationship between NHE and GDP in per capita terms. When KFF et al. say stuff like “While an increasing GDP per capita is associated with increased health spending, the United States is an outlier, spending more than similarly wealthy countries” they imply that GDP is a good measure of “wealth” here and that there is a linear relationship. GDP dramatically and systematically understates US “wealth” (perhaps better phrased as material standard of living) relative to these and other countries (some not shown in their simple analysis). Amongst other issues here, GDP per capita includes net exports (exports minus imports), tourism, banking, and other activity that does not directly contribute to the actual standard of living of the country. There are significant differences between countries of the “same” GDP. A country that derives, say, half of its GDP from exports or from tourism certainly gets economic benefit from that activity in the form of jobs and income, but that activity is not directly producing goods domestically, i.e., a country of the same GDP but that is not reliant of net exports, tourism (as in, tourists spending money on hotels, restaurants, etc), or the like is apt to enjoy a much higher standard of living and higher effective personal incomes than GDP alone would lead you to believe. So, with that in mind, here are three graphs to illustrate some differences between the United States and the OECD countries that we are frequently compared to (including some other very high GDP countries to make this point very clear). Long story short, GDP ought to be interpreted with a huge grain of salt if we are claiming to predict material living conditions and/or prevailing wages (note: healthcare is man-power intensive and does not scale like, say, manufacturing can in rich countries). To reinforce this point, and to highlight the double-standard of the nationalized healthcare proponents, vis-a-vis “it can only be because our system is (or is not) X”, here is a graph showing tertiary education expenditures in US versus other countries. Seeing a pattern here yet? Note: They did not use a linear projection here (unlike with healthcare) and still we are way above trend. GDP and GDP per capita are the measures most commonly used to compare the economic size of countries and the economic welfare of their populations (when economic welfare is measured by the volume of individual goods and services consumed). But they are summary measures. GDP, for example, says nothing about the distribution of income within a country, while GDP per head has limitations as a measure of economic welfare. Not only does it cover the goods and services that resident households consume to satisfy their individual needs, it also includes services, such as defense, police and fire protection, that governments produce to meet the collective needs of the community, as well as gross fixed capital formation and net exports neither of which constitute final consumption. A possible alternative to GDP would be individual consumption expenditure of households, but for the different ways health and education services are financed in countries. In some countries, governments or non-profit institutions serving households (NPISHs) provide the greater part of health and education services and these expenditures are included in the individual consumption expenditure of government or NPISHs. In other countries, households purchase nearly all health and education services from market producers and these expenditures are included in individual consumption expenditure of households. In these circumstances, individual consumption expenditure of households is not the correct measure with which to compare the volumes of individual goods and services actually consumed in different countries. Household in countries where government or NPISHs are the main providers of health and education services will appear to consume a smaller volume of goods and services than households in countries where households pay directly for the bulk of these services. To overcome this problem, the ICP has, from the beginning, added the individual consumption expenditures of government and NPISHs to the individual consumption expenditure of households to derive the consumption expenditure of the population. On a per capita basis, this is a better measure of the economic welfare of households as it comprises only the individual goods and services that households actually consume. It covers all such goods irrespective of whether they are purchased by households themselves or are provided as social transfers in kind by government or NPISHs. Two decades later the concept was adopted by national accountants. It is referred to as actual individual consumption in the System of National Accounts 1993. ICP comparisons are organized so that both GDP and actual individual consumption of countries can be compared. Actual Individual Consumption (AIC) = Expenditures consumed by individuals (including private, government, and non-profit/NGO transfers, subsidies and the like). This includes food, education, healthcare, housing, entertainment, transportation, and so on. These components (all adjusted for purchasing power parity, i.e., PPP) allow us to focus on that subset of GDP that most closely resembles the material standard of living of the country in question without injecting net exports, capital investment (as the sorts you’ll see in petro states to pay for future extraction), and so on. Ok, with that out of the way….. Observe how it accommodates a much broader array of countries here (e.g., Luxembourg, Kuwait, UAE, etc), generates a much tighter fit (r^2=~0.9), and actually does not increase linearly with income (that’s a 2nd order polynomial). Here is another way to approach the “outlier” question…. US disposable income is significantly higher in part because we have much lower taxes than most of Europe does (especially amongst the broad middle class), so let’s look at this by that component of AIC that’s actually spent by households directly (not government spending)! and on a broader array of countries…. Here is another chart whereby I remove non-government NHE (WHO numbers) from household consumption figures to exaggerate the effect of US NHE here. Even if we limit this analysis to the typical top ~40 OECD countries, thereby hiding the effects of large petro economies and the like with respect to very large systematic inaccuracies with GDP (for these purposes), we can still see that AIC significantly outperforms. For starters, when they use NHE per capita that significantly masks the extent of proportional inaccuracies for less affluent countries (i.e., the “same” variance in Y is much greater for countries lower down in the X axis than it is for presumably high income countries on the right side of said distribution). 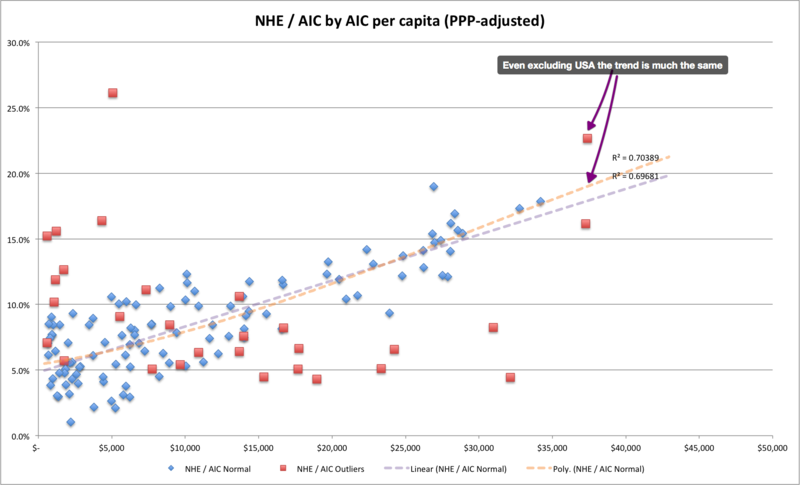 This effect is even more apparent when you actually look at this in proportional terms, i.e., NHE as percent of GDP by GDP per capita vs NHE as percent of AIC by AIC per capita! (see part 3 and 4 below)…. This difference is even more impressive when you consider that the latter, NHE / AIC, is against a smaller denominator, i.e., if exports, fixed capital formation, and the like we actually driving this incrementally, then we’d expect this to significantly underperform, not outperform. Of course there is still significant unexplained variance, but that variance is much less than what GDP predicts…. Now let’s try the same thing on the entire dataset (all OECD NHE numbers I could match), excluding and illustrating a few exceptional outliers…..
And here, just for fun, I excluded the USA to demonstrate the trend w/o US NHE skewing it. The polynomial trend still projects the USA at around 20% of AIC (which is surely repressed somewhat by Switzerland and Norway’s atypical behavior here). It’s still significantly non-linear and there is still significant variance from the trend (see the Netherlands at about 18% of AIC). Average Wage (OECD figures & formulation) by Average Individual Consumption by AIC. That income concept is somewhat different, but nevertheless the data points in the same direction. [Note: Even when you exclude the US, a huge economy, from the calculation the trend is pretty clearly for the food, shelter, entertainment, and the like to plateau while healthcare and ‘misc’ spending grow. Even if the NHE projection isn’t deemed sufficiently reliable here, the trends on the other major items implies growth of NHE. Along a similar line here, we can look at compensation in healthcare. Yes, US healthcare salaries are higher, but our salaries are higher across the board (the average, college grads, etc) because we truly are richer country and our people have higher real consumption expectations. Again, see education and numerous other statistics. Likewise, you can look at other measures of consumption…. Note: This includes all federal, city, state, and local taxes (averaged together nationally). Contrary to popular opinion, the bulk of this “extra” tax revenue in these European countries is raised on the broad middle class, not just the top few percent (which should be intuitively obvious if you think there is notably less pre-tax/pre-transfer income inequality there and understand these facts). See here for more extensive discussion of effective tax rates in the United States versus other OECD countries. Richer countries tend to spend more real money (volume) on lots of different things, albeit in somewhat different proportions. Lower taxed people tend to have more money to spend and, especially in rich countries, they choose to spend more of it on healthcare than some people might like. The above three clearly apply to the United States and to an appreciably larger degree than the countries we are typically compared to. We do not need to invoke bizarre explanations about lack of single-payer healthcare (or what have you) to explain this situation because we should pretty well expect this and there are lots of other industries and sectors where we see this sort of international disparity besides healthcare and education. Single payer systems might theoretically have some ability to cram even lower reimbursement (and other payments) rates down the throats of the healthcare industry (e.g.,physicians, nursing, hospital administration, medical devices, pharma, etc), but there are very real limits on what you can expect in a high income country like ours given prevailing wages in other industries. Comparing our healthcare salaries to that of, say, France without taking into account other wages is just silly. Likewise, single-payer might be theoretically be able to force patients to consume less, but those standards (in the real world) are going to be set according to the ability of people to pay and their already sated desires. Why should we expect US consumers to make the same spending choices that they do in significantly poorer European countries? I certainly believe that much of our NHE is subject to rapidly diminishing marginal returns (especially with respect to crude measures like life expectancy), but just where is the political will going to come from to support draconian restrictions, further reimbursement cuts, and the like? It seems to me that that people have this entirely backwards: cost containment (if this is really our #1 priority) must start with budgeting. So long as we are willing to pay (or borrow) for it, why should we expect the same choices here? Likewise, the data tends to suggest that, over the past ~20 years, Europe has experienced very real “inflation” of healthcare , too, no less, and sometimes more, than the United States. If these single-payer systems have it all figured out, if real increases in healthcare demands have nothing to do with it, and if actual salary demands have nothing to do with it, then why have they not succeeded in keeping costs contained? Obviously that’s just nonsense. Moreover, given the vast differences between the actual per capita spending and NHE as percent of GDP between various regimes in Europe, why is there so little apparent curiosity for what explains these differences (specifics, please)? I am not suggesting that there is no room for improvement here (obviously healthcare is very expensive) or that we cannot learn anything from other countries, but the analysis that has been presented thus far starts with the wrong premises (imho) and they present a very misleading picture. Out of curiosity, did you fit your models including the US data point? I could be wrong, but judging by the graphs above, I suspect that it was included in the fits. I realize the people you are critisizing may have as well, but particularly for a high leverage point (off on the right by itself in most of these graphs), to measure ‘outlierness’ you should fit without the data point and then look at the error term. Otherwise, your claim boils down to ‘it isn’t an outlier because it looks like itself’. You can pretty much eyeball it with all the other data points imo, but I also included plots with the US specifically excluded from the model/trendline. I also wonder — your complaint is that we should look at a comparison to personal income, because that is the money that we have in the states to spend on healthcare, but then isn’t it still as much of an apples to oranges comparison, because in other countries, the higher taxes that you cite are what pays for (at least larger portions of) healthcare? And now you’re excluding that? The obvious counter is that your R^2 jumped, but thats not as useful a counter when there is a process criticism of the measurement. And doesn’t it all kind of miss the point that we as a country are spending more per person for (ostensibly) comparable outcomes? GDP per capita measures something useful in the sense that it tells us how much the country has to spend on everything. AIC obscures that by removing the things we’ve already chosen to pay for. GDP per capita measures something useful in the sense that it tells us how much the country has to spend on everything. AIC obscures that by removing the things we’ve already chosen to pay for. 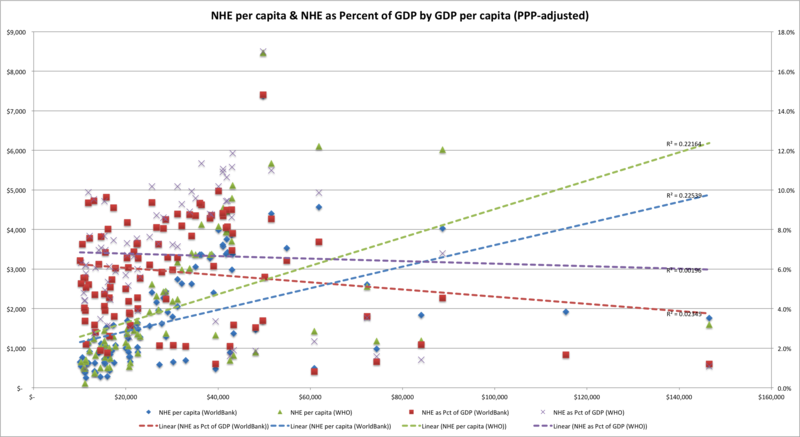 My perspective is that GDP per capita is particularly lacking when comparing the United States to other high GDP countries in this context as the true relationship between national “wealth” and health care expenditures is not linear and those few other wealthy countries tend to be heavily export driven or otherwise atypical in a number of other dimensions (e.g., small banking/finance centers like Switzerland). Although export activity, for example, certainly improves material welfare in the form of wages, profits, etc, GDP also captures those goods and services for export that do not directly improve domestic welfare. Consider two countries of approximately the same GDP where one has 0% net exports and the other has 50% net exports as a share of GDP. The former almost certainly has a much higher aggregate material standard of living than the latter (e.g., higher private consumption, higher government expenditures, etc). The wages and the like derived from export activity are already reflected in domestic consumption and other components of GDP, so including net exports will tend to systematically overstate material conditions in that country relative to others that are less export driven. Furthermore, theory aside, the relationship with alternative measures like AIC per capita is clearly much better than GDP per capita and in multiple specifications. This is true with both per capita spending and as a fraction of the relevant denominator (e.g., AIC, GDP, etc). GDP per capita is actually a weak predictor of NHE if you aren’t extremely careful about selecting comparison countries, even if you exclude very poor countries, so most of the analyses people are familiar with are quite misleading (or, at the very least, there ought to be greater appreciation for how sensitive these assertions are to the number and variety of countries picked). your complaint is that we should look at a comparison to personal income, because that is the money that we have in the states to spend on healthcare, but then isn’t it still as much of an apples to oranges comparison, because in other countries, the higher taxes that you cite are what pays for (at least larger portions of) healthcare? (3) the differences with skilled labor costs, from which healthcare tends to draw more heavily than most, are even more pronounced in the United States…. one might argue that we could change this through policy (e.g., more intervention in labor markets) but one should at least realize that we’re no longer just talking about single-payer or healthcare specific policy anymore. Btw-individual wage/income measures in the US typically exclude healthcare costs since the vast majority ofemployer healthcare contributions are typically excluded. More comprehensive measures of income and labor costs will typically reflect these extra costs and make for more apples-to-apples comparisons between countries, but they usually favor US on the margins here. AIC obscures that by removing the things we’ve already chosen to pay for. Where are you getting this from?????? And doesn’t it all kind of miss the point that we as a country are spending more per person for (ostensibly) comparable outcomes? Healthcare expenditures are very much subject to rapidly diminishing returns vis-a-vis overall life expectancy and there are many other factors that have very large influence on these sorts of aggregate outcome measures (e.g., current and historical smoking rates, obesity, homicides/suicides, auto/transport deaths, genetic/cultural diversity, etc…. most of which healthcare has very little ability to influence). US healthcare system itself generally compares quite favorably with others if you approach this from more of a value-add perspective at the individual level, i.e., looking at individual conditions, adjusting for individual health, etc, but that it costs a lot of money. We do more and spare fewer expenses overall, but these differences are generally well explained by the fact that we’re actually much richer than most. We could probably cut healthcare expenditures in half with little detectable effect on life expectancy or overall mortality rates. However, the will to contain costs doesn’t come out of nowhere and that doesn’t mean that there aren’t visible consequences for consumers in terms of their interactions with the healthcare system, quality of life, etc. Wealthier people will generally be more inclined to spend and be less price sensitive. The market for healthcare services don’t operate in a vacuum. Where is the will to make those sorts of cuts to come from? How many bright people are going to pursue medicine when they can earn considerably more and/or have a better quality of life in other fields? What else should individuals be spending their money on? Why have healthcare costs also exploded in the rest of the developed world as they’ve grown wealthier? I think your final paragraphs are much more accurate than the clickbait-y title. We are an outlier; even controlling for wealth, we still spend a lot more on health care. None of your GDP is a perfect measure arguments effectively address this at all. However, you slice and dice it, US spends more on health than expected based on wealth. The fact that we spend more on tertiary education is also easily rebutted by single payer advocates: unlike other rich countries, we rely largely on private organizations for higher education, as with healthcare. Some very old data about a few household items is hardly convincing either. I could cherry pick items Europeans spend more on (electricity, international tourism) too. The US spends way more money on drugs than other countries (not the main driver of health care costs differences, but a very clear example of my forthcoming point). Libertarians will say its because the FDA doesn’t approve enough drugs, liberal economists because there is no monopsony state buyer. Both are probably true, but for the purpose of your argument, both clearly suggest U.S. health policy is driving the price differences not U.S. wealth. Ultimately, I think your core point is that the gap in expected health spending is smaller than most people realize. I agree 100%. But you exaggerate how small this gap is throughout the article- not your strongest or most convincing piece. By the way, I think an argument that US health system actually achieves solid health outcomes based on per capita spending is a more fruitful line of inquiry (and very much against conventional wisdom). The thrust of my argument is that the United States is not an outlier. You can fairly point out it’s somewhat more than expected based on these (better) methods, something I don’t think I ever denied (wrote this ~2 years ago), but the model correlation isn’t exactly perfect and other reasonable comps have similarly large residuals despite top-down national healthcare systems, higher taxes, more heavily subsidized education systems, less obesity, lower historical rates of smoking, and, perhaps most importantly, appreciably less wealth per capita (~same PP difference with appreciably lower wealth per capita is likely considerably dearer). The title is an accurate description of the evidence, not “clickbait”. Can you point me to some literature on this? You can start with this or this. 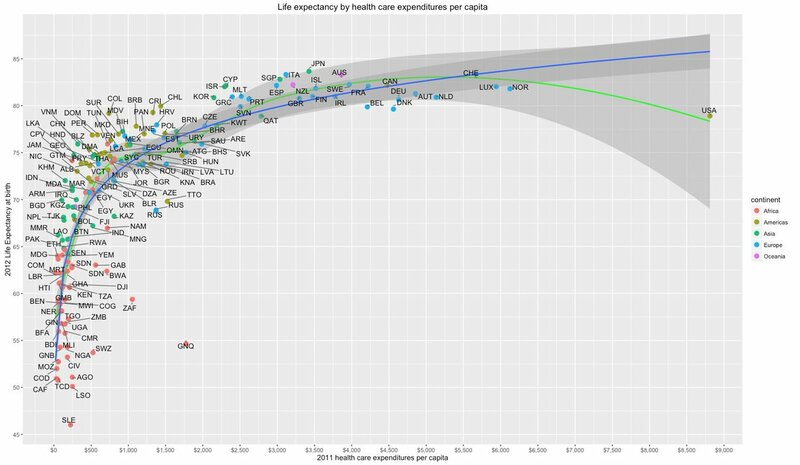 1) There is roughly logarithmic relationship between healthcare spending and life expectancy, which implies that you need to spend roughly twice as much on health to get the same increase in life expectancy as you did in the prior increment. The US and most other developed countries are past the point where the it appears to bend (in a linear plot), so I wouldn’t expect a large improvement in life expectancy even if US system were exactly like the modal euro system. 4) We also have good evidence that large gaps exist within countries by level of education, income, socio-economic status, region, etc, i.e., even in countries with single-payer or, at least, ~100% coverage, welfare state, etc they have been unable to eliminate these gaps, which strongly suggests there are things that the health system simply can’t control…. even in outcomes that are presumably amenable to healthcare (like death from cardiovascular disease). It’s worth keeping in mind that these same arguments, RE: much higher spending with worse outcomes, can be leveled elsewhere too. For instance, Norway spends more than twice as much on health care as Israel, Cyprus, etc and has worse life expectancy despite also being a significantly richer and having higher social capital on average. Do you really think Cyprus delivers better healthcare than Norway or are there maybe other factors that go into health outcomes like genetics, lifestyle, etc? I doubt it very much. Long story short: the expected change in outcome at that point in the national income distribution ( y ~ log(x) at high values of x ) are so modest and the level of confound substantial enough, that it’s very hard to say that something in obviously wrong with the healthcare system.